Everyone loves peonies…how can you not? Brides plan their wedding date around peony season. Flower enthusiast plant them all through their gardens. Florists go crazy over all the different colours and shades they come in because it is available in white, various shades of pink, coral, yellow, reds and more! The peony’s vibrant colour and irresistible texture are the exact things that make people fall in love with these flowers. 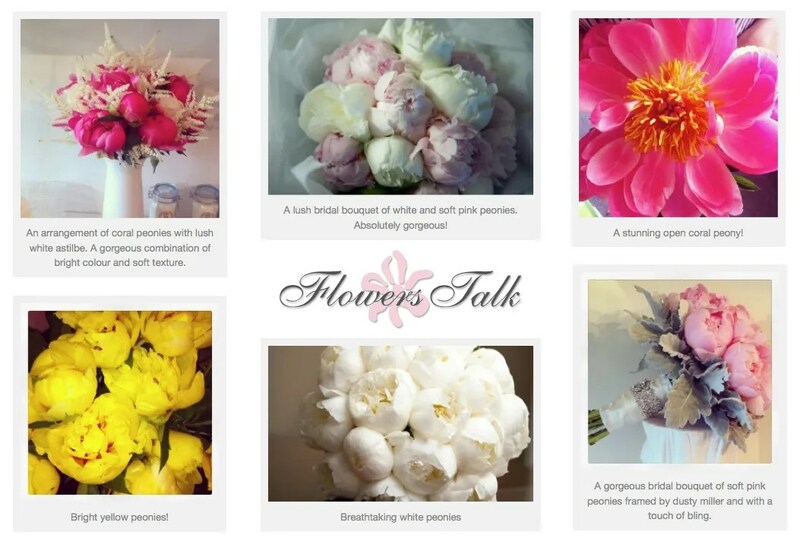 So, here are some of our favourite shots of peonies that we’ve worked with. Enjoy! One legend has it that the peony is named after Paeon, a physician to the gods, who received the flower on Mount Olympus from the mother of Apollo. Another tells the story of that same physician who was “saved” from the fate of dying like other mortals by being turned into the flower we know today as the peony. The traditional floral symbol of China, the state flower of Indiana, and the 12th wedding anniversary flower, the peony is known as the flower of riches and honor. With their lush, full, rounded bloom, peonies embody romance and prosperity and are regarded as an omen of good fortune and a happy marriage. So, whether you want your bridal bouquet full of lush peonies, or just want a few to decorate your kitchen table or even to brighten up your desk, make sure to stop by your local florist between late May and early July to get some of these lovely flowers! What’s your favorite peony color and why? Share in the comments! My favorite peony color is Pink and white as they reflects peace and calmness.When you take a flower in your hand and really look at it, it’s your world for the moment.Most people in the city rush around so, they have no time to look at a flower.Life is the flower for which love is the honey.